You’ve been around the game industry for a while. But there may be a few newbies that don’t know you. How about a brief bio? For those who don’t know me, my name is Seth Jaffee, and I’m a game designer, and a developer for Tasty Minstrel Games. 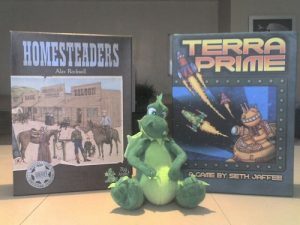 I snuck into the industry when my best friend Michael Mindes started a company to publish my first game (Terra Prime), as well as a game I’d helped develop (Homesteaders). I helped Mike behind the scenes as the little company grew, and now I’m a full time member of the TMG team. 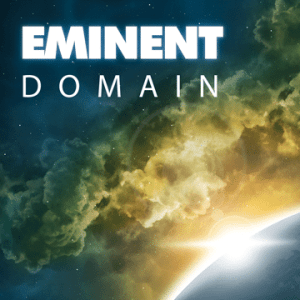 My best known game is probably Eminent Domain, a space empire building, “deck learning” card game, which has 2 expansions out already and a 3rd in production as I type this. 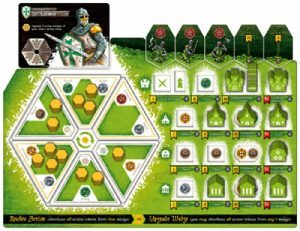 My latest game, Crusaders: Thy Will Be Done, was recently on kickstarter and will be out early in 2018, soon after backers receive their deluxe versions. Ok, let’s talk about your publisher hat first. You mentioned that you are the game developer for TMG. What do you do in that role? I design and discover games for TMG, and I develop them to be as good as I feel they can be, then I usher them through the production process, doing some art direction, and some coordination with manufacturers. Since the TMG team has grown, I generally hand off the project once the manufacturer’s production proofs are approved. What is the most satisfying part of that role? As Hannibal on The A-Team used to say (am I dating myself here? )… “I love it when a plan comes together!” I especially like when the final art and graphic design comes together to make a game look as good as it did in my mind’s eye when playing with the prototype. Like any job, there are good parts and bad parts. The worst part is probably rules editing. So many little details, so many rules to follow, and not all of them universally agreed upon! Sometimes it’s difficult to explain even the simplest process clearly, in a way that many different people will understand. Yeah, it seems like that is the most popular answer to “what’s the worst part of game design?”. Reprints – TMG is starting to land some sweet reprints. Can you talk about how that came about and any future ones to look forward to? We work with publishing partners all over the world, always on the lookout for the opportunity to reprint games we like, and that we think our fans will like too, as well as to license our titles into different languages and regions. Since I’m usually working on design and discovery of new titles, I’m not too involved with reprints or licenses from partners. Sometimes I get asked if a particular game is one we should do, so I’ll weigh in on that, but I’m not usually the one making those deals, so I couldn’t say offhand which future ones you should look forward to. You are also partnering with overseas companies to bring cool games to the USA. Would you talk about that a bit? We have a good relationship with certain overseas designers and publishers that we’ve built up over time. 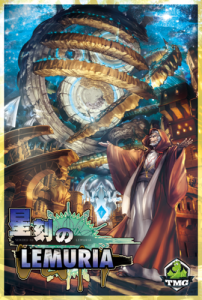 For example, we licensed Orleans from Reiner Stockhausen, one of our first “Deluxified” products. That went over very well, and so you’ll see more TMG-DLP partnerships in the future. Also, Michael has become enamored with Japan, and he loves to go to Tokyo Game Market, where he’s built relationships with various people, and he always comes home with a pile of potential imports. 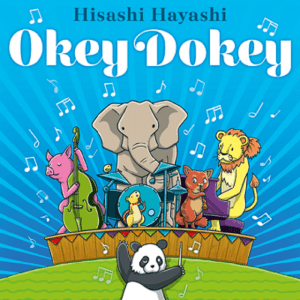 We’ve done a number of games by Hisashi Hiyashi, from big games like Yokohama (another very successful Deluxified product), to small cooperative games like Okey Dokey, which just launched at GenCon. I’ve seen tweets of Okey Dokey. I need to check it out. As a game developer, what designer would you love to bring under the TMG umbrella? Any of the big name designers, really. But especially Antoine Bauza, I think. I’ve also been impressed with Phil-Walker Harding lately, and Alexander Phister has been very popular these last few years. Phister is gathering an impressive stable of published games. Do you have a publishing philosophy or a style of game that TMG is focusing on? There are a few “lines” of games that TMG tends to do. Euro style strategy games (45-60 minute medium weight, or 60-90 minute medium-heavy), and smaller, shorter, lighter family games. We like anything that excites us, really. The only things we shy away from are abstract games, 2-player only games (though not entirely a dealbreaker), arena combat style games, and games with a lot of output randomness. EmDo was one of the first big KS hits. It seems like forever ago. You’ve expanded that universe some with Battlecrusiers. Any further expansion plans? Eminent Domain: Oblivion, a 3rd expansion to the original card game, is in manufacturing right now and should be out by the end of 2017. In addition to that, I had made an Eminent Domain dice game a few years back, and that might eventually see the light of day. 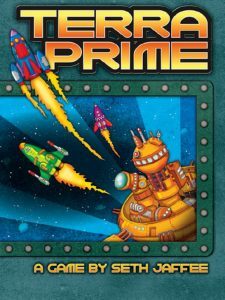 Finally, I’ve been looking forward to the opportunity to re-release my first title, Terra Prime, re-themed into the Eminent Domain universe as a sort of prequel to the card game — and that should be happening in the next year or so. I’m excited for that. I think Homesteaders and Belfort are my all time favorite TMG game. Any plans around either of those? I don’t know about Belfort, but we’re just wrapping up artwork for an expansion to Homesteaders, so watch for news on that to be coming soon! Sweet! My kids will be very glad to hear that. Most underrated TMG game? Which one do you wish more people were playing/talking up? I guess I’d have to say Terra Prime. Production issues, and it being a small publisher’s first game, led to a disappointing release of a game that I personally think holds up even today. 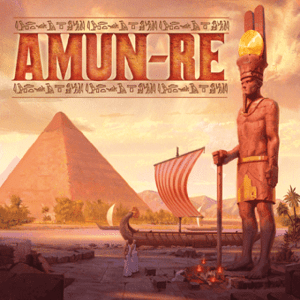 That’s why I’m so happy to get the chance to revisit it, with some experience, add the expansion I made several years ago, and re-release it as Eminent Domain Origins. I can’t wait to see it. I liked the original game and know the new edition will be even better. Most successful TMG game? It depends on how you measure success. I think Dungeon Roll has still sold the most copies. 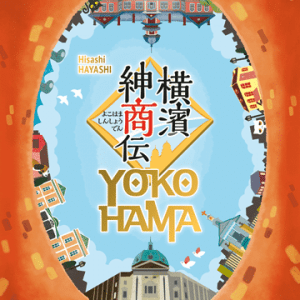 I think Yokohama Deluxe brought in the most dollars on Kickstarter, and I think Eminent Domain has had the most re-prints so far (and the most expansions and related products). Biggest surprise either game or happening? I’m not sure, maybe the reaction to the Deluxified line of games… it’s a pleasant surprise how well the whole idea has been received. TMG in B&N and Target. Congrats! Any other “targets”? I remember when we first got a game into Barnes & Noble, it sounded so unbelieveable! I don’t know if we have any other plans for getting our games into big box or mainstream stores, but there are people on the team who are always looking for ways to sell more of our games! There are some lesser known TMG games – Citrus, Lemuria. Tell us about them. Citrus is an import from DLP, and Lemuria is an import from Manifest Destiny. Both of these have had original releases, but may not have been as widespread as some. Since we didn’t use Kickstarter for these, they might be coming out a little under the radar. Both are euro-style games that will fit right into our respective line of euro and Japanese imports. This one isn’t necessarily a TMG project, at least not yet. It’s a game I’ve been working on, and if I finish it and it’s good, then it’ll probably find a place in the TMG lineup. Automatown is a worker placement game where you’re building robots in an effort to assemble an army strong enough to take over the city. It’s intended to be quick-ish and light-ish, taking about 6 rounds to play. Each round you send robots to rotating worker spots to get resources and convert them in order to build more robots, which give you combo-y abilities as well as additional workers to place. Dairyman – what’s it about? 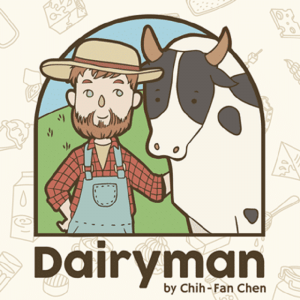 Dairyman is one of our lighter, small box games. It’s a press-your-luck dice game from Taiwan where you roll a bunch of dice looking for combinations of 2-3 dice that total 10 pips. Then you choose to roll again, or spend your pips to produce milk (which is worth points). If you successfully press your luck, you can earn Freeze tokens, which will turn your milk into ice cream, which makes it safe from spoiling, as well as gives you the helpful ability to reroll certain dice. Ok, TMG has Harvest and Pioneer Days coming out soon. I want to know all about these. Harvest and Pioneer Days are two titles that I have been working on developing for a LONG time now. We’re skipping Kickstarter with these two, they’re both debuting at Essen 2017, where TMG will have a booth for the first time. 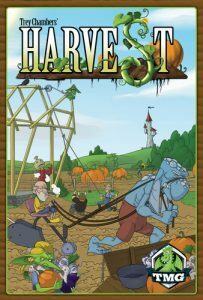 Harvest is a compact worker placement farming game by Trey Chambers, where you draft turn order, place workers on variable worker spots, and try to earn the most points over 5 rounds of play. 5 rounds with only 2 workers does not sound like much, but add in a bonus that comes with your turn order, and a special ability or two from your character, and you can get a surprising amount done in those 5 short rounds! I put a lot of effort into balancing everything, and (along with the designer) designing and testing the many characters in the game. That sounds really interesting. Very tight and fast. I like that. I can imagine that it was a challenge to balance. 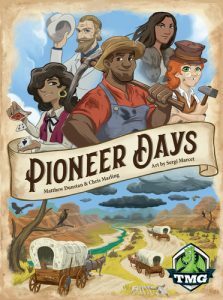 Pioneer Days is a bigger, euro style dice drafting game which comes across like the old video game The Oregon Trail. You spend 4 weeks heading out west, collecting cattle, mining for gold, and recruiting townsfolk to come with you. But along the way, you’ll have to contend with disasters such as storms, disease, famine, and raids. I had a lot of fun working on all the little parts of this one, from balancing and character design (much like Harvest), to re-working some of the mechanisms supporting the core dice drafting in the game. For both of these, I’ve played a few games with the production proofs, and they really look and feel great! I can’t wait for them to come out at Essen and take the world by storm! Let’s talk about your game designs now. As a game designer, who would you love to co-design a game with (I’m available btw.)? I’m not sure. I used to think that co-designing was the way to go, but I may be re-thinking that more recently. I guess it depends on your relationship with the co-designer, and the mutual buy-in each party has. Isle of Trains went to a second printing. How does that feel? It feels great! Isle of Trains actually had a second printing a while ago… my understanding is that early next year they will be launching (possibly on Kickstarter) another reprint, along with an expansion we gave them. I think it’s good to see a game out there with my name on it that isn’t from TMG, I think it might lend more credibility to me as a designer. 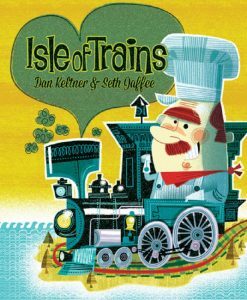 Though I’m a co-designer on Isle of Trains, that one to me felt more like a development project, as Dan Keltner had the original idea for the game. I really like Isle. I got to ‘test’ it for the contest and it hooked me. I’m happy it is getting an expansion and will have some legs for a while. Let’s talk about Crusaders, Thy Will Be Done – your latest design. 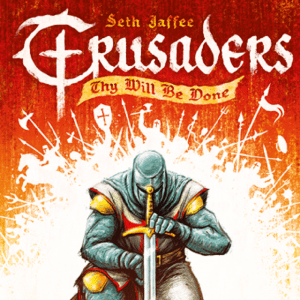 Crusaders was a game I started on around 2012, (I remember us talking about it.) and finished a couple of years ago. It’s one I really liked, and had played quite a bit. When TMG was going to move forward with it, I got a little giddy, and then when it was decided that Crusaders would be our next Deluxified product, that excitement went up to 11! It was really great to see all the people excited about the game, and I can’t wait until next year when people will be able to play it, in all it’s deluxe glory! You’ve talked about a Terra Prime reboot. Tell us more about that. So cool. What’s going on with Alter Ego? Now that’s a design that has been sitting on the shelf for far too long. I picked it up recently and got it to the table for a test or two, and I even figured out something that may be an improvement! Alter Ego is a cooperative deck learning game of vigilante heroism. As players, you have had enough with the crime in your town, and you’ve decided to band together and do something about it. But you’re new at this, and in order to train and become stronger as a hero, you’ll necessarily have to neglect some part of your alter ego life – your job, your family, or your community. I love the story behind this one, and I would love to wrap it up and get it into production. It would be great to see a final version of it out in the wild some day! That sounds really fun. It’s a different perspective for a supers game. Do you have a design philosophy? I’m sure I do, but I don’t know if I could put it into words. Some part of it is this… some designers (and some players) think it’s not worth making a game that doesn’t do something brand new, novel, or innovative. I don’t agree with that… often times the games that innovate, while they do come up with something novel and new, don’t use that innovation to its full potential. I like finding better ways to use these novel mechanisms. In other words, when making a game, you don’t have to innovate if you’re improving on what’s out there. Also, as long as the game experience is new and novel, the mechanisms themselves don’t have to be. That is a neat idea. No one else has expressed that particular philosophy to me before. I agree with you. I don’t need create something brand new if I can improve or add to something that already exists.Is there a game mechanic that you haven’t conquered yet but want to build around. Not in particular. I’ve only designed a couple of games from the ground up, but if you consider all the games I’ve worked on in a development capacity, I’ve actually touched quite a few different mechanisms! You have a great blog,where you talk about your designs and thoughts. First, thanks for sharing. Why blog? What does it do for you? The primary use of my blog is to record thoughts on games and projects so that I can revisit them myself later. A secondary use is to share those ideas with readers. I don’t get a lot of comments on my blog, which leads me to believe that not many people are really interested, but that’s OK because most of it is for my own reference anyway. What designs are you working on? Now that Harvest and Pioneer Days are finally coming out, I’ve started moving on to other projects. In my notebook I listed out all of the games I have playable prototypes of, and found that it would take about an hour and a half to pitch them all at a publisher speed dating event! Automatown, which I discussed above. Alter Ego, which I discussed above. Deities & Demigods, which is sort of like a deck learning game with a common deck. This one is almost done, I just created a bunch of player powers to try out, but haven’t gotten any of them to the table yet. Evaluating about 6 submissions that I’ve brought home from Origins and Gencon, several of which are very promising! Best advice for us aspiring game designers. Keep at it, and don’t get discouraged if things don’t turn out the way you thought they would the first time around. Design is all about iteration! Pitch Tag: Pitch me a game about…shapeshifters. I’ll stick with worker placement, and say that your workers are of specific types. Maybe different animals, or alien races, or just nationalities. Each type of worker can be used in specific ways, or for specific things, in addition to the standard stuff that any old worker can do. But then you can get Shapeshifter workers, which, for some in-game cost, can act like a worker of any type (i.e. they can change from one type to another). So thematically maybe each player is a different faction of a shapeshifting alien race, and you’re all trying to infiltrate human society. But of course you want to infiltrate the highest levels of the government, military, and intelligence communities, so you shapeshift your workers into the various different types of people in order to gain access to places like the white house, the pentagon, etc. in order to facilitate your faction being the one to take over the world! That sounds pretty cool. What is something most people may not know about you? Wow. I didn’t know that. Interesting. Well, Seth. Thanks being my guest on GFG. It was great catching up. Readers, if you want to talk to Seth you can do so by tweeting him at @sedjtroll, emailing him at playtmg.com, or checking out his blog, Cumbersome. And as always you can contact me tweeting to @tomgurg or email goforthandgame@goforthandgame.com.